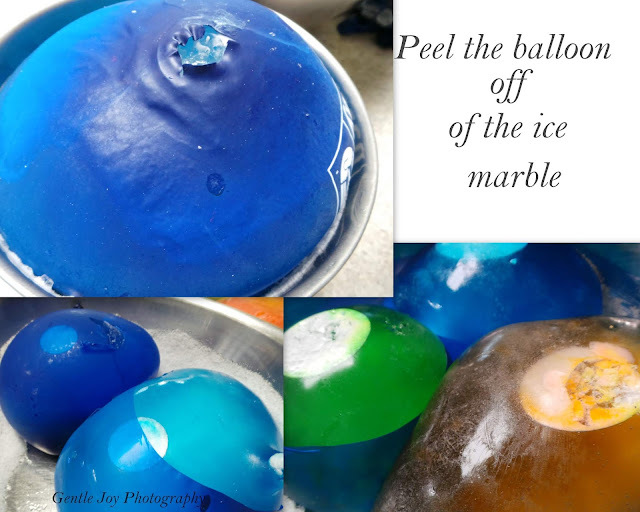 How to Make: ICE MARBLES! 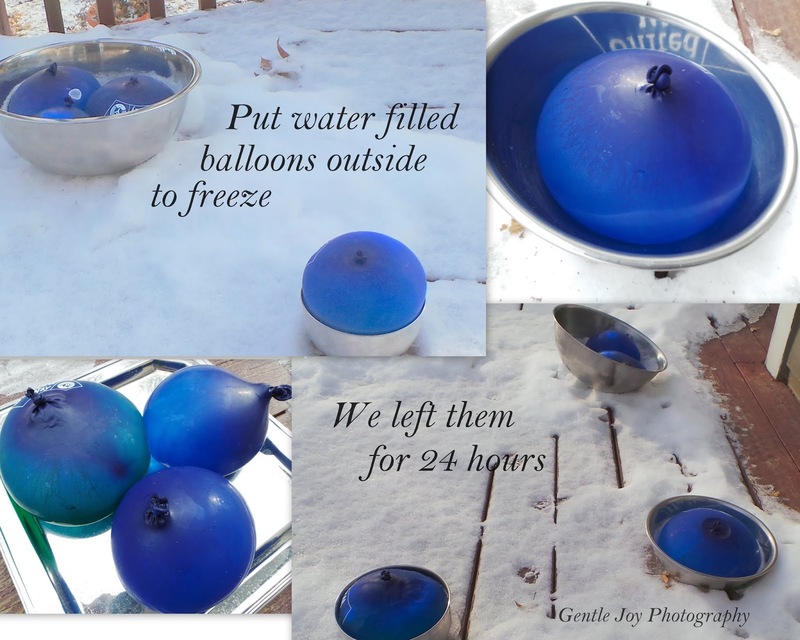 Fun and easy.... Just put water in balloons and freeze them. You can add food coloring if you like. In these, I put some liquid food coloring in the opening of the balloon, then attached the end to the kitchen sink faucet and filled it, tying off after. We put them in stainless steel bowls and trays because the balloons were very hard to carry and we didn't want them to break. We put ours outside in the cold as it was bitterly cold. These could also be made in the summer, using the freezer, for a summer activity. Some balloons had and an air pocket and some showed the neck of the balloon. Some had cracks which made them look even more like marbles. After peeling the balloons off of the ice marbles, we took them back out to the cold to keep them from melting. This one cracked a lot, but stayed together and we liked the patterns. This orange ice marble was not totally frozen inside. Though they were out for 24 hours in very deep cold, I had 3 big balloons nestled together in a large bowl and I had used warm water to get a clearer ice marble, so that is probably why it wasn't totally frozen. This looks like an ice cave and we enjoyed seeing the crystals and patterns after the water left. These are a good project.... fun and easy. Kids and adults both enjoy seeing them. We have put these along a walkway in the winter and they last quite a while if the weather stays cold. Enjoy the precious times with making memories with your family... they are so important. Swamp Pie.... No, it doesn't sound very appetizing, but it is something that has become special to my family. There was the original Swamp Pie which is how it all started, but I decided to do an updated version and we all agree it tastes even better than the original, though the original was good too. 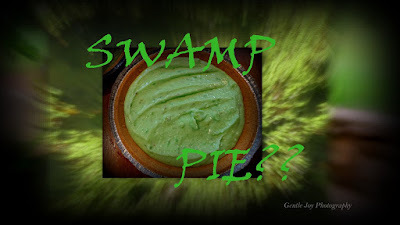 You can read about the original Swamp Pie post here: WHAT Is Swamp Pie??? The updated version of Swamp Pie adds just a bit more richness and flavor to balance out the sweetness and we think it is a big improvement, although my family likes both. We do not have Swamp Pie often, but every once in a while someone says, "Remember when you used to make Swamp Pie?" and we decide to have it again. The most recent time was several months ago and as a bit of fun we decided to make it since all of the family would be together for the meal. Our oldest son brought the girl who is now his wife. I was a bit concerned that she would think we are really strange because of having a dessert like that, especially with the name, but we all laughed about the story of the Swamp Pie and enjoyed our time. Birthdays at our house are simple, but special. The birthday person gets to choose the meal, the dessert and the activity. I laughed when my new daughter in law chose Swamp Pie for her birthday and we look forward to celebrating that birthday with her. This "pie" is very easy to make and doesn't take long either. Great for any age. Mix together, pat into greased 9"x 13" or 10" x 15" pan. Bake at 350 degrees for 10 minutes. Cool. Whisk or beat for 2 minutes, then pour over cream cheese layer. Spread over pudding. Chill then serve. It's a pretty easy recipe... and fun for the whole family. If you do make it, I would love to hear how you like it.... and if you prefer the original version or the updated version better. Foods like this form the memories which tie our family together and memories of past fun are enjoyed again as we have a fun treat. I have learned, though, to be careful to develop a name for the desserts I make up because otherwise the kids will name them. (sigh). If I had named this dessert, I would never have chosen "Swamp Pie", but now it seems to fit... and it is fun. Thank you for visiting and I hope you have a wonderful week. We have had a dream for many years.... of living in the country. The Lord didn't allow it until just a few months ago. What a blessing to be here and to be putting in our gardens, blueberry bushes and more. 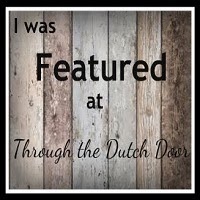 In this post, I am simply sharing some of the beauty of country scenes that we enjoy. Living in the country has been a time of discovery for us... discovering our own woodland area... it is small, but new to us. Also as spring is finally here, we are seeing what is growing wild on our land... like gooseberry bushes (we have never had those, so we will be learning), may apples (another new thing) and more. The purple fields are not ours, but they are so beautiful to see. If you have read my blogs for any length of time, you know that I LOVE to take pictures. It is fun to have so many new scenes to see and enjoy! We do have a small barn - actually it is a shed built to look like a barn, but it's great for pictures as well as storage. This guy was on our property... about 30 feet from the house when we saw him. He left quickly, but I was glad to get a couple of pictures of him. The bird songs are amazing and we are hearing more of them now that spring is finally here. We have finches, mockingbirds, blue birds and more. They are beautiful. The farmland is beautiful (and smelly in the spring, but that is part of country living!) . We have 2 1/2 acres which is 10 times the land we had in the city. We are loving it.... and staying very busy! We are already using this property a lot and look forward to what we can do with it. There have been many unexpected expenses since we moved .....frozen pipes and flooded driveway in the deep cold, very high electric bills for heating in this very cold winter, and more.... so we are really hoping to save some money with harvesting our own fruits and vegetables. There is a lot of work involved and we are tired, but it is exciting too. I liked how this photo turned out even though it isn't a usual photo. I am enjoying snapping many pictures and experimenting. Anyway, it is so good to be back... thank you for joining me today and I look forward to reading your comments. Have a great week! Well, swamp pie came about because years ago, I wanted to come up with a quick dessert for my family and needed to use what was in my cupboard because I had no extra money for a treat and couldn't get to the store. I don't remember the occasion... maybe just to encourage my husband, but I knew we wanted a treat for the meal. The cupboards had food, but not much in the way of extras and money was quite tight, so I wasn't sure what I would find... we were out of so many things. I did find a couple of things that someone had given to me, that hadn't been used yet.... so decided I could make a quick and easy dessert... and I knew the kids would like it and I hoped my husband would too. My many children were quite young at the time and rather excited about the strange looking pie. My family loved the treat and the kids kept asking what it was called. I told them it didn't have a name. That bothered them and they promptly dubbed it Swamp Pie, amid many giggles. The name stuck... and the name couldn't be changed after that, though I admit that I tried. 🙂 It became one of our funny family stories. Those 2 ingredients? ....................... A graham cracker crust and a box of pistachio pudding mix. We made swamp pie a few times after that first time and the kids loved it. One child even chose that for their birthday "cake" a couple of years. I haven't made it for a long time and had forgotten all about Swamp Pie until recently and decided to make it as a treat for my family. Our oldest son, who lives on his own, was home and we talked about Swamp Pie because I was planning to make it the next week. He was on his phone and not paying attention to the conversation, but when he heard the words, Swamp Pie, he perked up and asked "What? What is Swamp Pie?" He said it sounded familiar and he knew he should know, but couldn't remember. It was obvious that the memory was a pleasant one.... and we made sure we would have it when he could be here. When I made Swamp Pie the first time, I just mixed the pudding as the box said and dumped it in and chilled it. It was a bit messy, which added to the appeal for the kids. When I made it this time, I lessened the amount of milk I put in the pudding and it set up better. Either way, works fine. This time, I made 2 pies for my family of big eaters... and they were enjoyed. We laughed about the silly name and how it seemed so intriguing and daring to them when they named the pie years ago. A super simple recipe and a tasty treat. Pour into pie crust and chill. That's it... it really is super simple.... and yet has a fun name. It was enjoyable to bring that memory back to our family again. A small thing, yet those small things bind us together... What a blessing. I also have to admit that Swamp Pie does sound more interesting than Pistachio Pie, although I'm sure some would argue the point! I never would have chosen such a name, but now it fits. Either way, we sure enjoyed it! This muffin isn't sweet, it is savory. It is packed with meat, cheese, seeds, veggies and more. This one passed the family test also. I made 4 batches of the recipe I have in this post. Like I said, I have a big family and I like to have some muffins in the freezer, so I made a big amount of them. I put everything in at the same time and just mixed it that way. It simplified making the muffins. It was a bit challenging to stir in because I made such a large batch, but it worked fine. The batter is thick and chunky and it is easy to spoon it into the muffin cups. I feel guilty sharing this, but I will anyway. We sprayed the bottom of the muffin cups to keep them from sticking. I don't like doing that, but it does help the muffin papers to come off the muffin quite easily. A couple of years ago, I found these brown baking cups at a garage sale. There are 500 muffin cups in a box! They were $2.50 each box. I went ahead and bought 3 of them, joking about it being a lifetime supply for me. Well, we went through 101 of them today! What a blessing that special deal has been to me. :) Special deals like that come rather seldom, which is why I bought 3 of them. I sure am glad I did now. A fork works well to take the hot muffins from the pan to put them on cooling racks. The cranberries are rather tart in here, but we liked them. TIP-Buy extra bags of fresh cranberries at the end of the Thanksgiving season and keep them in the freezer. They are easy to pull out for recipes like this. Sometimes, they even mark the price down, although I have found that to be rare. Like I said, I made 101 muffins today and here are most of them. There were several eaten for "testing purposes" :) and also for lunch since I didn't make any with all of the other cooking and baking going on today. It was a very busy Saturday. You can also used cut up chicken... or bacon bits. ...........................................Stir all together gently, but thoroughly, in a large bowl. These store well in a zipper freezer bag. Thank you for visiting. I hope you have a wonderful week.